Pancreatic Enzymes 500 mg by Vital Nutrients helps me regulate gastro function. 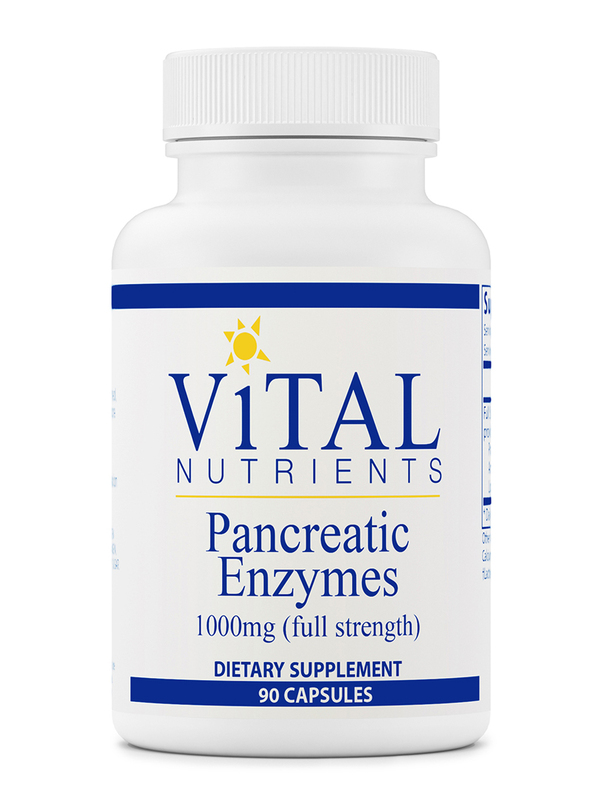 Pancreatic Enzymes 500 mg by Vital Nutrients is as good as creon at 1/10th the cost. Stool sample test revealed I am not breaking my food down and as a result I am lacking important nutrients. My MD put me on these and have noticed an overall improvement on how I feel. The pancreas might not be as well known as other organs‚ but it also has some very important roles to play in your body. Your pancreas is hidden between your stomach and spine‚ and is responsible for making your stomach less acidic while releasing insulin that helps control your blood sugar levels. It’s also in charge of making sure that all of the proteins‚ carbohydrates‚ and fats you eat are broken down so your body can absorb them and use the nutrients they contain. Your pancreas is filled with molecules called enzymes that kick start the digestive process. When you have certain conditions like pancreatitis (an inflamed pancreas) or cystic fibrosis (a disease that causes mucus buildup in your pancreas)‚ your body can’t make enough digestive enzymes or properly utilize existing ones. This means your body can’t break down some of the foods you eat‚ which can lead to nutritional deficiencies and other issues. Pancreatic Enzymes has been independently tested for several criteria‚ including stability and bacteria‚ solvent residue‚ potency‚ authenticity‚ and yeast and mold counts. 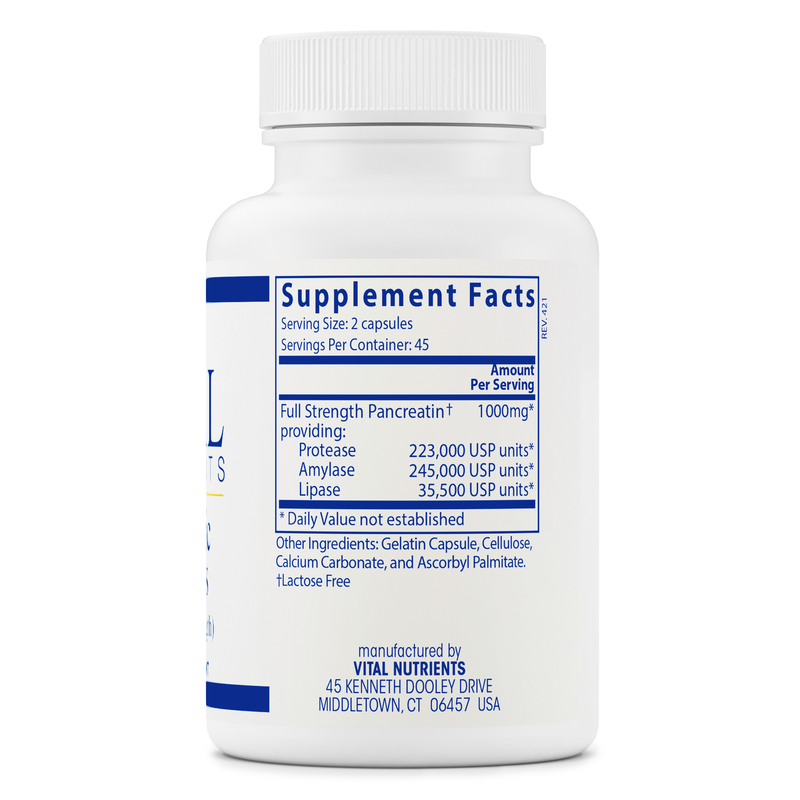 Each bottle of Pancreatic Enzymes by Vital Nutrients contains 90 capsules. The recommended dosage is one or two capsules after a meals‚ unless otherwise directed by your doctor. Other Ingredients: Gelatin capsule‚ cellulose‚ calcium carbonate‚ and ascorbyl palmitate. 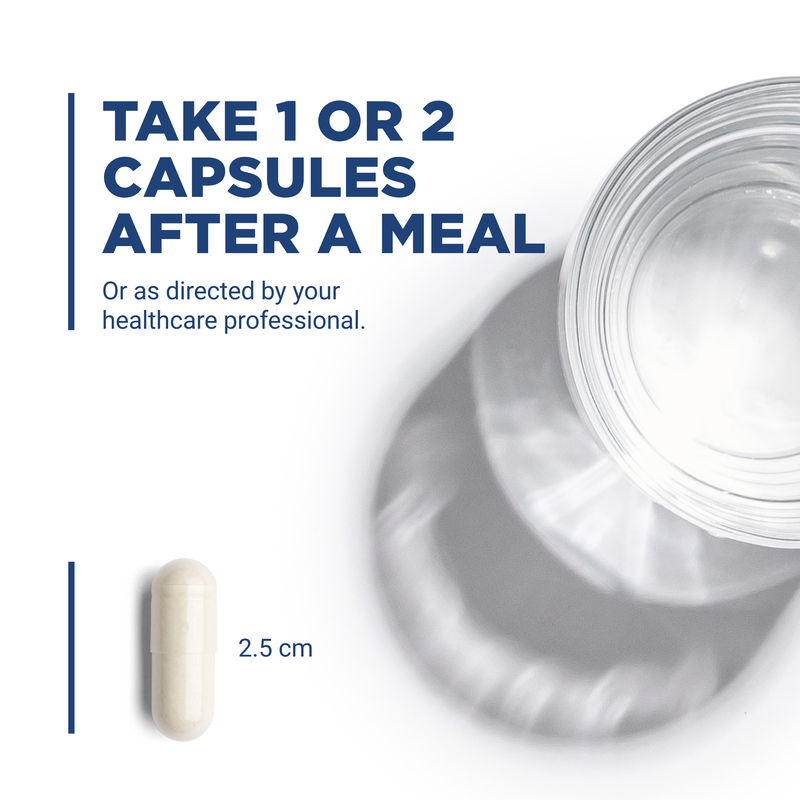 1 or 2 capsules after a meal‚ or as directed by your healthcare professional. This is a product that has a learning curve with the use of it. At first, it was a life saver. Then it created just the opposite problem that I was having. It's been about 3 months and I have finally learned the best way to use the product - for my system. Now, my house will never be without it! It has turned my painful, digestive issues around completely. Love this item. Had surgery 9 mos ago that affected my pancreatic enzymes. I was recommended Pancreatic Enzymes by Vital Nutrients due to the high potency by my doctor's office following surgery. This product really works and helps digest the food I eat. I take these with breakfast, lunch and dinner. It helps my body to digest my food. The potency and quality is excellent. I wish the price was a bit lower. I take two of these Pancreatic Enzymes 500 mg by Vital Nutrients at the end of my meal. It helps me digest and this brand and product was highly recommended by my doctor. I feel great when I use it and I’ve been using it for a long time! I purchased expecting a good result . I don't recommend this Pancreatic Enzymes 500 mg by Vital Nutrients. I took two enzymes with food and didn't feel any different. I still am feeling bloated with a lot of gas. My insurance company wanted me to pay $440 a month for the pharmaceutical company version of this. When I told my GI doctor's NP that it was not feasible for me to pay this amount per month, she told me about PureFormulas. I'd probably have to be hospitalised without Pancreatic Enzymes (full strength) 500 mg by Vital Nutrients. Think of how much that would cost the insurance company. My 85 year old mother has been using Pancreatic Enzymes by Vital Nutrients for just a few months and the stomach aches are gone. Pancreatic Enzymes did the trick, she had tried many other products with no relief. saved me hundreds od dollars ! I searched for a product liek Pure Formula pancreatic Enzymes as a substitute for a prescription medication that would have cost me hundreds of dollars per month. 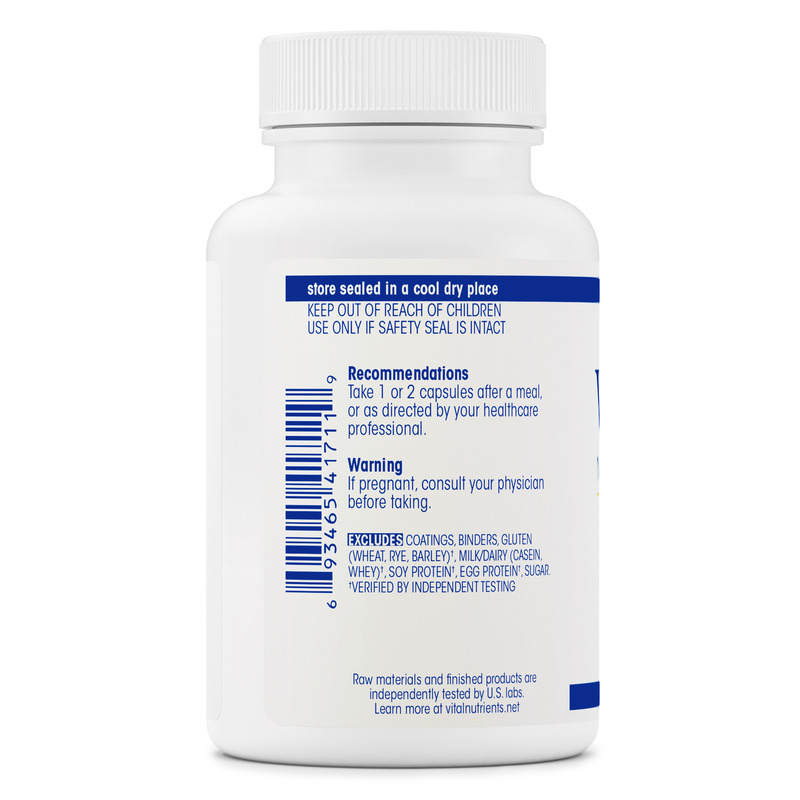 Product information proved to be identical and has saved me great pysical discomfort as a digestive aid. Thanks again. I plan to take it for the rest of my life. !